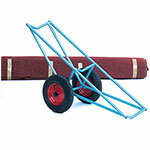 This specially designed carpet truck makes light work of shifting bulky rolls of carpet around. Its strong blue painted tubular steel frame sits on top of two robust 400mm diameter pneumatic tyred wheels. This product weighs 16kg.